절에서 의식을 행하거나 불단 위에 올려 놓고 향을 피우는데 사용한 향로 가운데 이처럼 완형(盌形)의 몸체에 나팔형으로 벌어진 다리와 원반형 받침을 둔 형태를 특별히 향완이라 불렀다. 백장암 청동은입사향로(百丈庵靑銅銀入絲香爐)는 높이 30㎝, 입지름 30㎝의 크기로서 몸체와 받침대를 따로 만들어 연결하였고, 전체에 은실을 이용하며 입사한 고려시대의 향완의 전통을 계승한 조선시대 작품이다. 입 주위 넓은 테인 전에는 가는 선으로 된 원이 9개가 있고, 그 안에 범자를 새겼고 그 사이에 덩굴무늬를 가득차게 새겼다. 몸통의 표면 앞뒤로 이중의 가는 선으로 된 큰 원문을 은실로 새기고, 그 안에 5개의 작은 원을 만들어 내부에 다시 범자를 각각 새겨 넣었다. 원과 원 사이에는 덩굴무늬가 가득 차 있고, 몸통 아래쪽에 두 줄로 18개의 연꽃잎이 있다. 받침대는 2단으로 되어 있으며 ,위에 길쭉한 연꽃잎 6장이 있고 그 아래로 덩굴무늬가 있다. 조선시대에 와서 원권의 범지문이 새롭게 바뀐 점을 볼 수 있으며 아직까지 문양은 유려하게 입사되었다. 입 주위 전 아랫부분에는 명문이 남아있어 조선 선조 17년(1584)에 만들었음을 알 수 있어 조선시대 전기까지 고려 향완의 모습이 계승된 점을 잘 보여준다. 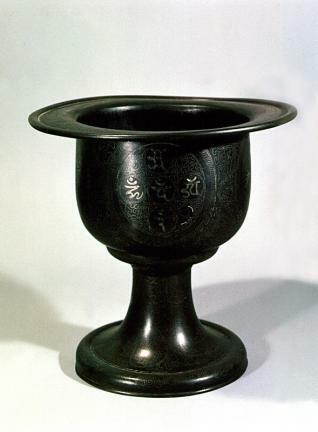 Hyangno (also known as hwawan or hyangwan in Korean) are incense burners that were used to burn incense in a temple so as to cleanse the mind. Hyangno is an all-inclusive term regardless of the shape or size of the burner, while hwawan and hyangwan refer only to bowl-shaped incense burners supported by a high trumpet-shaped strut. This bronze incense burner with an exquisite silver-inlay design of Baekjangam Hermitage is 30 cm tall and 30 cm in diameter. Its body and base were made separately and fitted together. It is a great work of work that is entirely covered with silver-inlay. Rimmed around the mouth are nine thin circles, in which Sanskrit characters are engraved, while all the other spaces are filled with vine patterns. 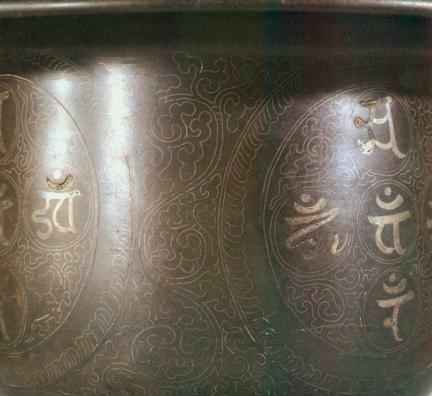 The body of the burner is engraved with large circles with double thin rims using silver threads in which five small circles and five Sanskrit characters are engraved, with vine patterns filling the space between the circles. The lower part of the body is decorated with eighteen lotus petals. The incense burner has two bases: the upper base, which is designed with patterns of six long lotus petals, and the lower base, which is decorated with vine patterns. 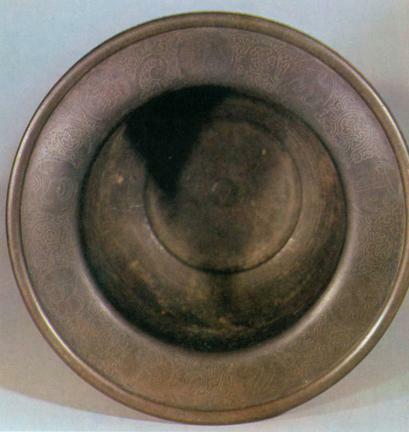 According to the letters inscribed just beneath the rim of the mouth, this bronze incense burner was made in 1584 (the 17th year of the reign of King Seonjo of the Joseon Dynasty).